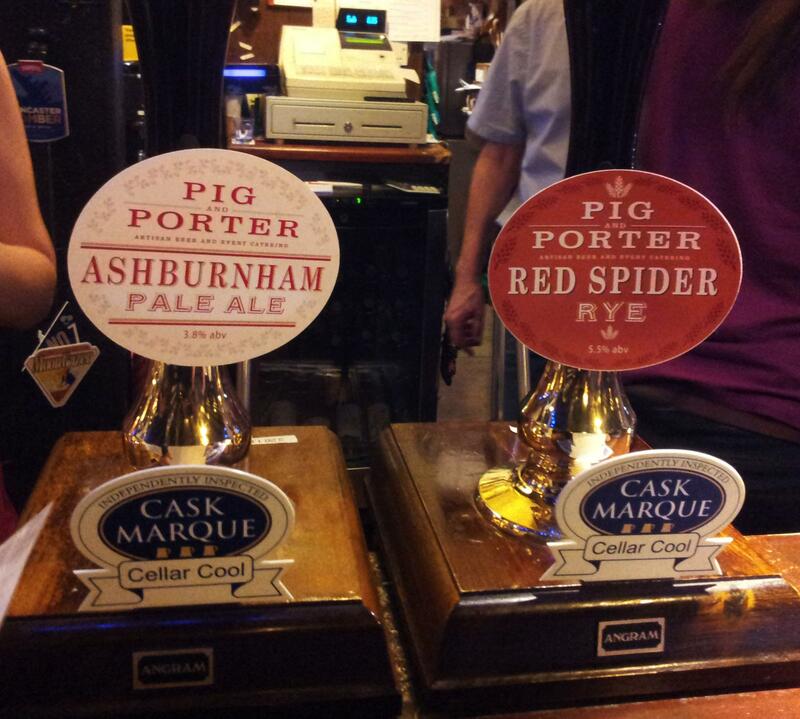 Pig and Porter… you know you oughta! Picture the scene… you’re in a great pub, drinking amazing beer and chatting with some really interesting people. They tell you they brew beer. Not only that but they love good food. Better still they have plans to put the two things together and launch a groundbreaking events catering business. Wow! You think, what a great idea these two great people have come up with! Then, after the great night out with the beer and the banter, they invite you to their launch party and although you have high hopes, confidence even, in their brewing and cooking skills you are also a tiny, little bit frightened that you won’t like their beer and food. 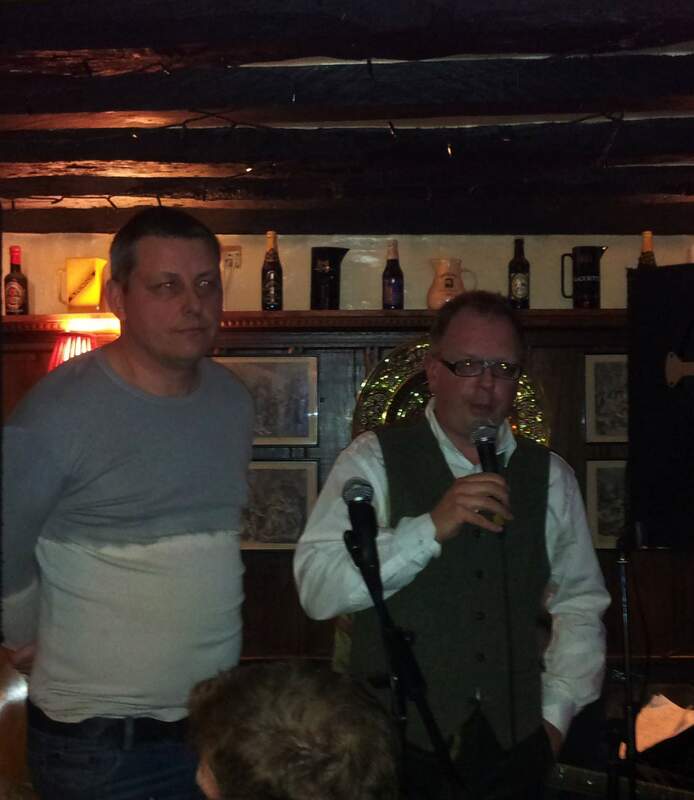 Fortunately when it comes to Pig & Porter (as previewed in my last blog post about beer innovation) there is absolutely no need to be afraid.Their official launch at The Unicorn Inn in Canterbury last week was a great party with fantastic beer and food. The men behind Pig & Porter, Sean Ayling and Robin Wright. I started the evening with their crowd-pleasing, but definitely not boring, Ashburnham Pale Ale (3.8%) which was a malty-biscuitty delight perfectly balanced with punchy, hoppy bitterness of the sort that made me love beer from an early age. If more breweries had the courage to use more hops in their ‘core beers’ (marketing speak, apologies) then the UK would be an even better place to drink than it is already. I don’t mean to be down on hop-cautious brewers. I understand that bitter has a bit of a patchy reputation what with the negative connotations of the word. For me however, cask ale has always been about that bitter, dry finish that makes you want to drink more – but there seem to be fewer beers of this style around than there once were. Hence my joy at this one. I may have to move to Kent or Sussex in the hope of living somewhere it is regularly stocked so I can drink it in my local. Pig & Porter beer. What to look for on the bar in Kent, Sussex – and Surrey – pubs. Pig & Porter’s launch party food offered a demonstration of what they can offer as events caterers; a high end hog roast producing delicious pulled pork served in lovely white bread rolls with a choice of sauces. I had mine without sauce and was immediately transported to my Nan’s kitchen where she used to feed me slices of her roast pork on Sundays running the risk of me wanting to scoff the lot and not eat the roast dinner my Mum would have been slaving over. Succulent and juicy with just the right amount of heavenly porky fattiness – the only thing that would have improved it is a vegetable side of some sort, sauerkraut or sautéed leeks perhaps, but that’s because I am somewhat five-a-day obsessed. Suffice to say that judging by the perfect pulled pork Robin Wright, the foody half of Pig & Porter, knows how to cook. As well as hog roasts I hear his burgers have also received rave reviews and that he is a dab hand at barbecues and braai. The Ashburnham Pale Ale was also sold out. Had it not been for the Black Cap Coffee Stout (4.6%), a collaboration with Downlands Brewery near Brighton where P&P ‘cuckoo brew’, I may have cried. Instead I asked for a half in a stemmed glass (shame all the pub could offer on this front was a small Stella Artois chalice – but you can’t always have everything) and quaffed away on this tasty rich, dark brew with a pleasing aftertaste reminiscent of fine Cuban cigars and which includes not just coffee but cocoa powder added at the sparging stage. It could have used a little more C02 (a natural by product of the brewing process) but because it was so rich in flavour, with good body but still managing to be refreshing, it got away with it. Had my sadness at missing out on the Red Spider Rye not already been quickly kicked into touch by the coffee stout it soon would have when a bottle of something rather rare and very special was proffered at me. Sean Ayling – the brewing half of P&P – was one of only three people given the chance to brew with a hop currently going under the inauspicious name of OZ97a. (You can read more about it on Mark Dredge’s Pencil & Spoon blog here.) Like the amazing Charles Faram developed Jester hop which I wrote about last year this is a British hop but with flavours you might not expect from one. I popped the bottle top and poured a lively brew with a big Belgian style head. Carefully avoiding snorting this tempting foam I gave it a sniff and was rewarded with an aroma of geraniums! I couldn’t wait to taste it. Mango sorbet with elements of raspberry pavlova creaminess shot through with notes of brown sugar enveloped my taste buds. It was quite unlike anything I’d ever tasted before. If this is what OZ97a can do in a beer then I hope it is soon in commercial production. That Sean was one of those asked to brew with it is, I think, indicative of what sort of brewer he is; bold, adventurous and proficient – there is plenty to suggest that Pig & Porter beers will become more than a little bit desirable. My only worry is that their bright idea of combining brewing with events catering could get swamped by the popularity of the beer. I suggest you book them now to make sure this doesn’t happen. I’d love to Phil, sadly the commercial crop won’t be available until 2015 at the earliest. 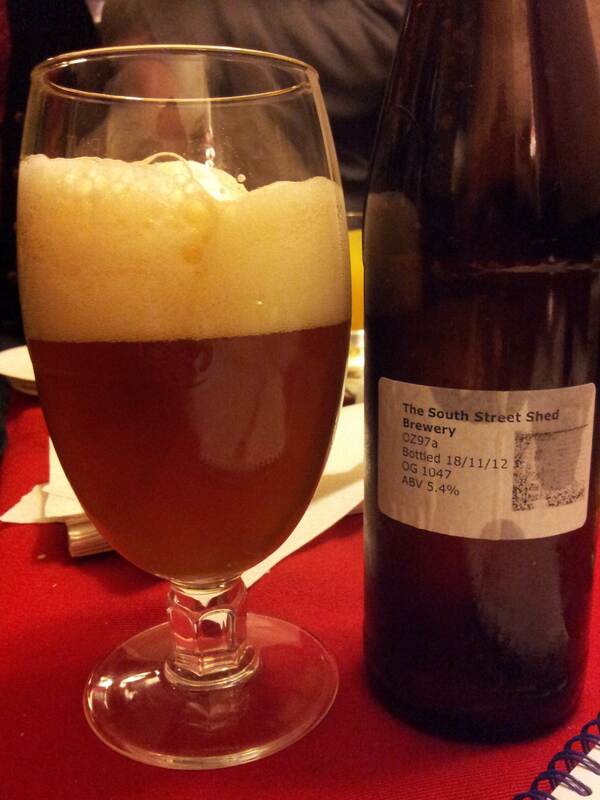 Robin and I have just rinsed the cornie of it that I homebrewed. Is OZ97a definitely going into commercial production then? I tal;ked to Mark Dredge about it early in 2013, and I’d love to follow up. Hi Jeremy. Best ask the British Hop Association about this. OZ97a is one of their developmental varieties. I understand that various tests for disease and pest resistance need to be carried out – over a few seasons – before a hop is commercially produced though. I will post an update on here if I can find news.